Check out NYTimes coverage of the Mermaid Parade. Many Dance Theatre Etcetera folks are gearing up for yet another summer festival…just this time not in Red Hook. Coney Island’s annual Mermaid Parade is taking place on Saturday, June 21 ALL DAY. Click the pic for more info. Thank you to the weather, thank you to all of our community partners and funders, and especially…THANK YOU for coming! Don’t forget about all of our volunteers – especially those from South Brooklyn Community High School and Brooklyn International High School! Check out our first batch of pics! We still need a few more folks to help out at the Red Hook Fest. Email julia@dtetc.org if you’re interested. Getting Ready for the Waterfront Arts Festival! 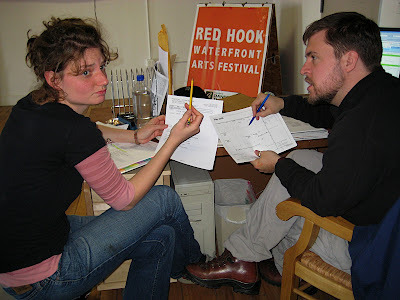 Bob and Therese in a heated debate over who should perform at this year’s Red Hook Waterfront Arts Festival.